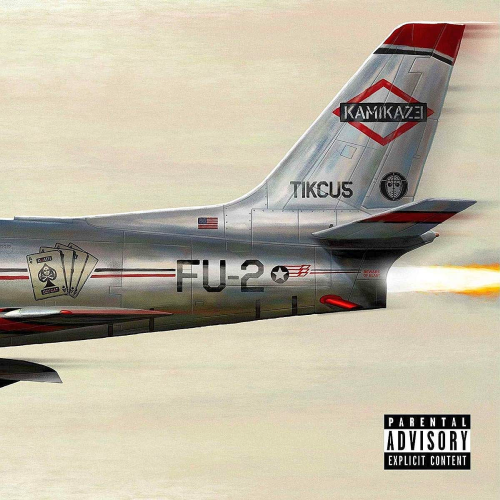 Date: 14.09.2018 | RnB, HipHop, Rap | Tags: Eminem, Kamikaze, Aftermath Records, Shady, Interscope Records | Download Eminem - Kamikaze (2018) for free. Kamikaze saw Eminem calling out a whole bunch of rappers including Tyler, The Creator and Machine Gun Kelly, as well as music critics in general in defense of his previous album Revival from their criticism. This new interview sees Em expanding on this defense of Revival, as well as explaining why he dropped the album as a surprise and why he took shots at those he did especially Machine Gun Kelly. Plus, he finds the time to talk about earlier albums Recovery and Relapse. The new album too was not without it's criticism and controversy. Eminem was called out by Justin Vernon of Bon Iver for supposedly using his vocals on Fall without his permission, as well as for his use of a homophobic slur when referring to Tyler, The Creator on the same song.